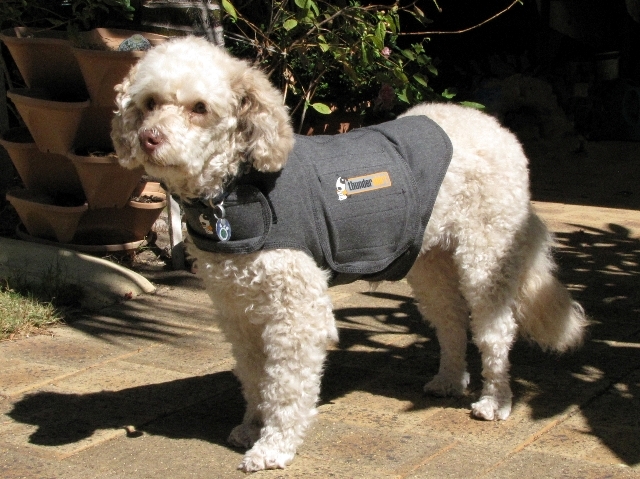 Occasionally: Thundershirt passes Fireworks Test! The fireworks were a good test of the Thundershirt Gladys; it seems to have passed with flying colours. Terrified dogs are no fun, not for the dog in question, the owner or others close by. Over Easter my neighbours left their little dog alone all day, each day and late into the night. The poor little thing barked for hours on end, and especially at night when the slightest sound sets it off. It's fine for the owners, they're not here to hear the distress, nor do they have to listen to the endless barking that drives us all to distraction. Perhaps a Thundershirt would help calm the little mite. Welcome to the world of blogging Gladys, I'm sure you'll find much to occasionally write about (clever name for your blog, by the way).